Enter now the Tenderflake Bake Your Prize Contest, in it, you get the opportunity to Win 1 of 4 $1,000 prizes. 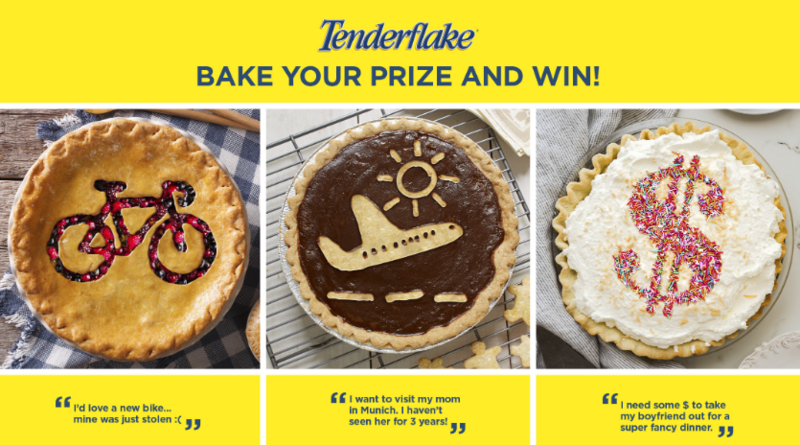 To enter you have to bake a pie with 2 Tenderflake pie shells, decorate the pie with the prize you want to win (p.e. a bike), take a picture of it and upload it to your Facebook or Instagram account using the #BakeYourPrize hashtag an tagging @Tenderflake. The contest closes on Friday, December 28, 2018 at 11:59 pm ET. Winner will be selected by random draw from all eligible entries. There are 4 prizes available to be won, each consists of $1,000 cash. The Tenderflake Bake Your Prize Contest begins on Monday, December 10, 2018 at 12:00 p.m. ET and ends on Friday, December 28, 2018 at 11:59:59 PM ET. The draw will take place on the week of January 7, 2019. Winners will be contacted by Facebook or Instagram direct message.